If you haven’t found yourself recruiting Gen Y candidates, or managing a member of the Millennial Generation, chances are very good that you will -- and soon. An estimated 80 million Gen Y workers are new to the workforce or preparing to enter it. And they are ready to get down to business and produce for those who know how to harness their unique professional potential. Yet with all the epithets floating around about this generation of workers - including “entitled,” “narcissistic,” “spoiled,” and even “lazy” - understanding what to do with these young, digitally-savvy, and confident professionals continues to stump many recruiters and managers. Some simple statistics paint a very different picture of who the average Millennial worker actually is: in a recent Pew Research Center survey, 73% of Millennials surveyed listed being a good parent or helping those in need as their top priorities in life -- only 15% listed having a high-paying career as the top priority. Such priorities are at odds with their profile as “Generation Me” and “Generation Next” for their self-focused view of the world. 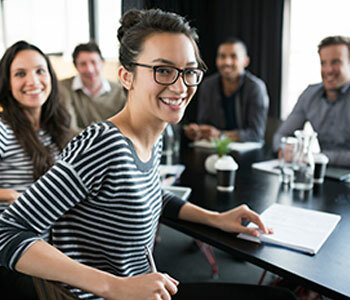 In spite of the cultural hype, as a generation Millennials have a lot to offer employers, especially when it comes to the ability to connect and communicate through the latest technological trends. Statistically, Millennials are the most socially connected generation, with over 75% having a social network profile -- conversely, only 50% of Gen Xers have social network profiles. And they define themselves as connected: a majority of those surveyed by Pew cited “technology use” as the most defining characteristic of their generation. This isn’t surprising. Gen Y’s have grown up with the technology that allows us to communicate and access information at the speed of now; in fact, they helped shape this technology first as primary consumers of products like Nintendo and now as industry leaders in companies like Facebook. Compared to previous generations, this social media generation overwhelmingly sees technology as a means to make people closer, work more efficiently, and make life in general easier. But their strength is also their weakness -- employers have found that social media savvy doesn’t always translate to interpersonal savvy, and that coming of age with Instant Messenger, Smartphones, and Twitter has wreaked some havoc on attention spans and the ability to manage time. On average, Millennials report sending 20 texts every 24 hours; about one third reported visiting social networking sites several times a day -- habits that are not necessarily conducive to focus, productivity, or face-to-face interaction. Beyond a well-thought out social media policy, how can managers harness and work more effectively with this Millennial generation, when their strength is one of their weaknesses? The answer is to provide fast and regular feedback that encourages their technological savvy while developing offline business acumen. Much of Millennial interaction takes place online, where feedback is instantaneous. Whether it be retweets, “likes” or comments, the feedback – good, bad, and ugly – is always there. Even a lack of feedback (no retweets, no likes, no comments) is a form of feedback online. Managers can’t underestimate the impact of growing up in this type of an environment has on training, employee motivation, and performance among Millennials, or how sensitive they can be to reading explicit and implicit messages in the workplace. Create opportunities that let these emerging professionals shine creates a working environment that can provide some “early and easy wins” as they start their careers. It also gives managers a chance to validate their contribution through positive feedback. Invite your Gen Y workers to manage the corporate blog, handle the company’s Twitter stream, or research competitors through their Facebook accounts. These tactics will help engage and integrate new Millennial members into your team. Simultaneously, make a point to expose your Gen Y professionals to traditional business skills by including them at in-person networking events; allow them to assist in team management. As you engage your Millenials, be sure to provide them with timely feedback to help increase their offline business acumen – all within a feedback loop that they are comfortable and familiar with. At their core, Millennial workers are no different from Gen Xers or Boomers: they want to be successful, proficient in their jobs, and stable in their careers. Managers who understand this can break down some of the mystery of the inter-generational workforce and realize that Millennials aren’t a new kind of worker, but a worker with new kinds of skills who needs to be managed in a different way. Nacie Carson is the director of development services at Cleaver Company, a boutique professional development and consulting firm, where she researches, develops, and helps corporations implement leadership and skill-development programs. Her writings on career development, life balance, and the gig economy are published regularly in Entrepreneurs-Journey.com and Portfolio.com as well as on her popular site, TheLifeUncommon.net. For more information, visit TheFinchEffect.com. Check out the Monster Infographic: Who Is More Entrepreneurial Minded: Gen Y, Gen X or Boomers?